Villa Bougainvillea is located in Latchi, Cyprus. This detached vacation rental property is air-conditioned and sleeps up to 8 people with 4 bedrooms, 4 bathrooms along with private swimming pool and sea views. Living room, dining area, kitchen, w/c wash room. 2 double bedrooms each with en suite bathrooms, 2 twin bedrooms, family bathroom. Balconies at front and rear. Private pool, sun terrace, barbecue, private parking. Villa Bougainvillea can sleep up to 8 people. Additional Pool Features: Pool Shower, Poolside Dining Area and Sun Beds. There is also a Barbecue. The large secluded pool has no other villas overlooking so you can sunbathe or enjoy a nice relaxing dip in total privacy. From the balcony you can enjoy meals while overlooking the pool and sea views over Latchi harbour. Beside the pool is a dining area with barbecue. "Beautiful Vila,Clean, and Great Location"
Villa is absolutely superb! The grounds are huge and the facilities are fantastic. The outdoor BBQ absolutely amazing and we cooked more out here than we did in the main kitchen in the house. If youre going, you also need to try the local winery. A great fun retreat. The main house itself is fabulous, with a high quality Standards as well as well equipped, loads of space for sitting/lounging/watching tv. There is two bedrooms with ensuite bathrooms, and 2 more bedrooms so plenty of space. We also enjoyed Balcony with eating area and beautiful sea views . We has the pleasure to stay in Villa Bougainvillea for a week and had a lovely time. It was heaven to wake up to the beautiful view and also have the option to swim in the sea or in the beautiful pool. The location is great - We Hired a car to get around in Cyprus if one is looking for an actual holiday. Lots of restaurants only a few minutes drive. 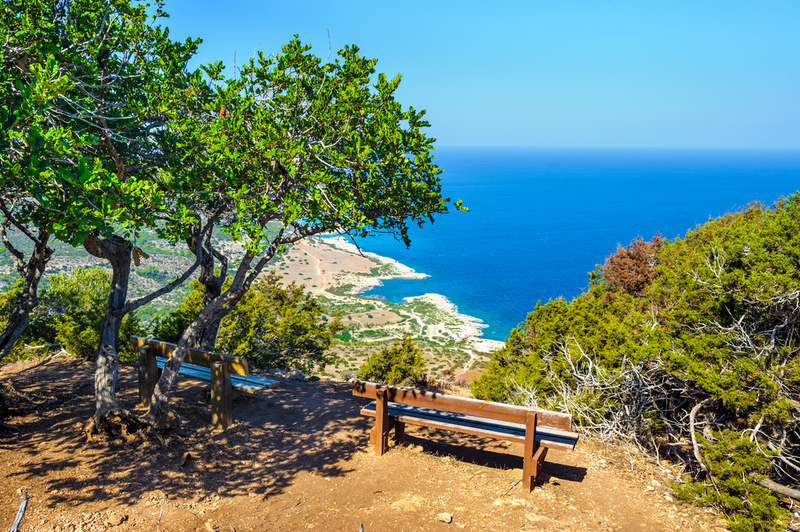 It is about a 30 minute drive to Paphos, but really easy to get to by bus or rental car. The villa is completely private and not looked on by any other properties. It has everything you could want. It is a good base to have lots of days out. We visited the beach, Paphos, a winery, nearby Polis and lots of other places all within an hours drive. It is possible to walk to Latchi for the evening - it takes about 30 minutes but the road coming back at night has no street lighting so you need to take care. The air conditioning in the villa is only in the bedrooms - you have to pay extra for the downstairs area which we didnt know about and isnt mentioned on HomeAway so it did get very uncomfortable in the evening. You can of course have the doors open but that attracts the insects. We would certainly recommend the villa and are considering getting a bigger group next year and which would include hiring the villa next door. Lovely villa and very well equipped. No issues at all. Very peaceful location and we had a lovely relaxing week. Had a lovely two week stay in the villa the pool was a welcome relief from the very hot weather would not hesitate to have a return trip. The attention you afforded us was 100%. It is refreshing to know that you care about your visitors throughout the duration of their holiday, as well as the lead up to it. I would say Agni Travel have a winning ingredient. Thank you. I would definitely look at your villas for other holidays in the future. It is also an excellent website. We asked for a villa in a secluded place and couldn't have been happier. 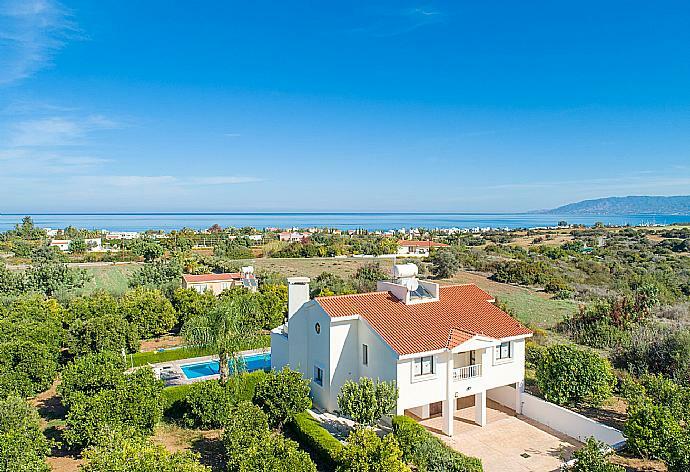 Lovely spacious villa with the most spectacular views. The only sounds we could hear whilst lying by the pool were the birds singing and the odd goats bell making this a holiday one that I will always remember.Thank you Agni Travel Team we couldn't have asked for more. We enjoyed our stay in your villa Bougainvillea very much. We were with seven men & women. The villa was very comfortable. The kitchen was excellently equipped. The swimming pool was a pleasure after our daily trips. We enjoyed the barbecue. The view was beautiful.Thank you very much. Everything was excellent including the service from your Agni Travel team. Compliments from our group. Good holiday, good size villa with 4 good size bedrooms and a nice pool. Excellent service from Agni Travel team whilst in villa. Amazing.... do not wish to write too much when one word can say it all, all i now need to say is Thank you for such a wonderful experience i loved every moment. Many plus features: clean linen lovely pool large outside table wonderful setting spacious. The house sits in a lovely orchard a wonderful area and we had a great stay. Nice pool and generally enjoyed very much and we felt at home. I was very impressed with the service provided by Agni Travel, your team were very helpful at all times. A great villa with a great outside pool area. I think the description of the villa was very accurate. It was perfect for us, plenty of room for a family of 7. We would stay there again.